I don't know about you, but I'm really excited about the upcoming festival season! Its about to kick off and everywhere is selling beautiful festival themed and hippie-esque items. Thing is though, some of them aren't all that practical for a long day in a (probably) muddy field. Here is an outfit wish list I put together for the up and coming season, and something along the lines I myself will be wearing. So the whole outfit may not be *that* practical, but it sure as well is wearable at a festival! The rain mac is perhaps the most stylish one out there for festival goers right now, but I would be sceptical about its waterproof level. It would look lovely over the top of a ditsy floral dress, but this tribal print playsuit is more my style. I have to say, if I'm going to be wandering around a muddy field all day, I'll feel a lot more comfortable in shorts than a skirt. You may notice that the boots are actually riding boots. I always wear my riding boots when going to events in fields such as bonfire nights as they're waterproof and warm. This pair look really comfortable for standing around and walking - something you do a lot at a festival. Even though this pair are a little pricey, its better to spurge more on boots that are going to keep you going for longer than being covered in blisters and losing your toe nails to cheap wellies (be warned - this does happen)! What will you be wearing this festival season? Written in association with Equestrian Clearance. All opinions are my own. This is such a great outfit for a festival :) Just the right balance of practicality and style! The playsuit is gorgeous. I love that Miss Selfridge playsuit! Love the playsuit! 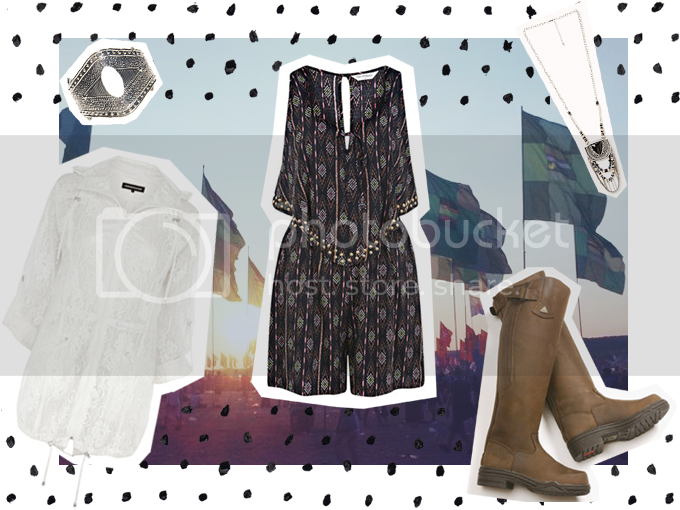 I'm really looking forward to the festival season... as you said, little pretty dresses rain macs and wellies! Hopefully get a chance to wear sunglasses at some point too! Ah that playsuit is absolutely gorgeous. Love the jewellery too. This is the perfect festival look. Definitely agree that it's worthwhile to invest in a decent pair of boots. I've made the mistake of buying cheaper wellies before, won't be doing that again! Love the picks! I'm not even going to any festivals but I'm excited about the festival season! That is perfect for festival season! :) I love this. Gorgeous outfit - the pattern is just lovely, really makes me wish I was going to a festival this year! !